Getting proCertum CardManager application started. 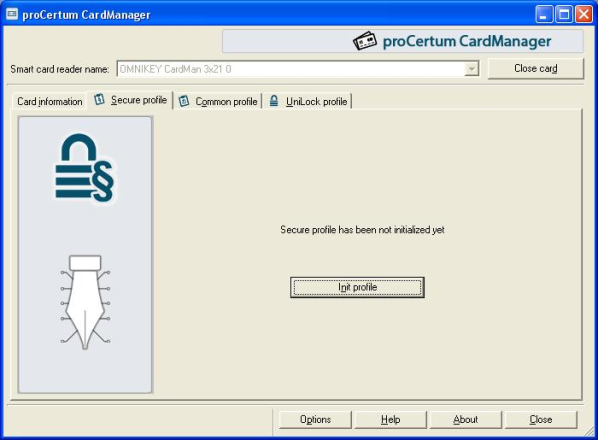 proCertum CardManager software is deigned for managing profiles installed on a cryptoCertum card. A user friendly interface makes it possible to generate PIN codes for certain certificates, delete certificates from a card by beginners on their own. as an integral part of other applications e.g. : Suscriptor, Auctor IC, cryptoCertum. 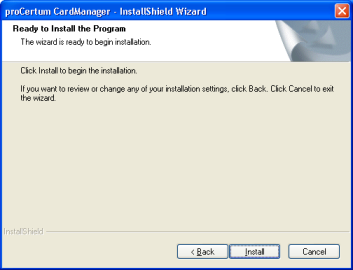 To start installation of proCertum CardManager application click twice on installer icon. 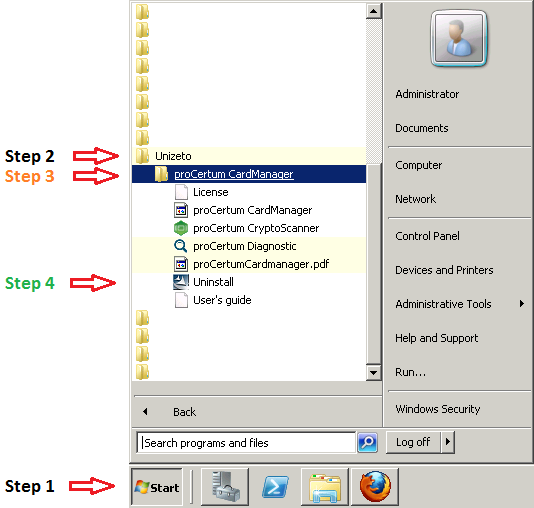 To start installation of proCertum CardManager application, double click proCertumCardManagerSetup.exe file icon (figure above) for one file distribution. For more file distribution double click setup.exe icon. After the installation starts, the language, in which the installation will be done, is to be selected. After the language is selected click Next > the opening window of the install creator starts. To continue the installation process click Next >. To cancel the installation process, click Cancel. Dialog window will be displayed, confirming and checking if the installation of proCertum CardManager application should be cancelled. After clicking Yes the installation will be canceled. To return to the main window of the installer click No. After you have read the conditions, you must click on I agree to License agreement conditions and then click on Next >. Otherwise (after choosing an option I do not agree to License agreement conditions) license terms and conditions will be refused and further installation will not be possible. The next step will be the selection of the location, where the files of proCertum CardManager application should be installed. Defaults to: C:\Program Files\Certum\proCertum CardManager. After choosing of final destination, click Next >. You can change the destination location. To do that, click Change.. Regular window of Windows explorer will be invoked. To confirm the selection of proper folder, click OK. The button Cancel let you return to the window of application Choose Destination Location, without executing any changes. 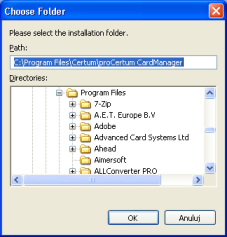 After selecting destination folder and clicking on Next > install creator is ready for the installation of proCertum CardManager software. To get the installation process started click Install. Installer starts copying process of application files. 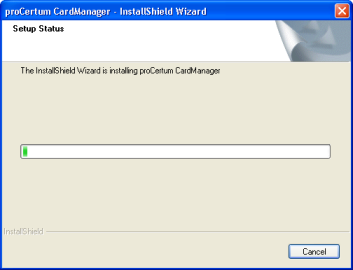 Clicking Finish closes the install creator of proCertum CardManager application and finishes its installation. 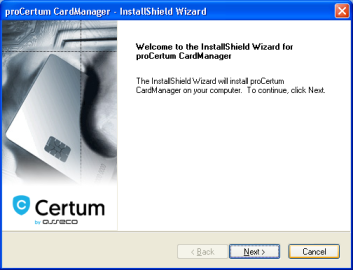 To get the proCertum CardManager application started select from the Start menu proCertum CardManager. 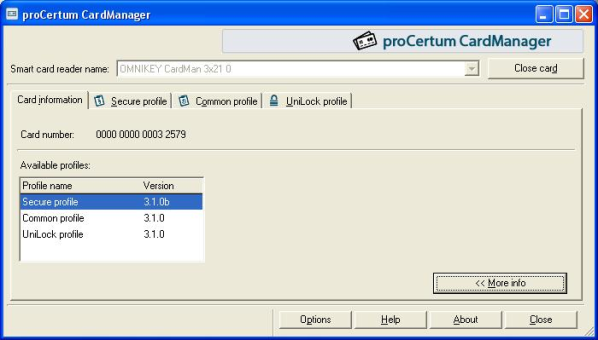 The main window of proCertum CardManager application will be displayed then. If there were more than one card readers installed on workstation, the user should select the proper reader first, which will cooperate with the program. To do that, select the appropriate reader from the pull-down list. The button Application info enables checking the version number of the software, libraries used by proCertum CardManager as well as license. 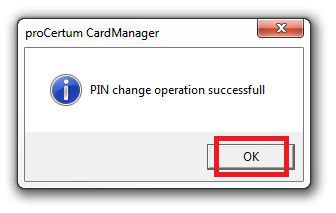 In order to exit proCertum CardManager application you should press button Close. 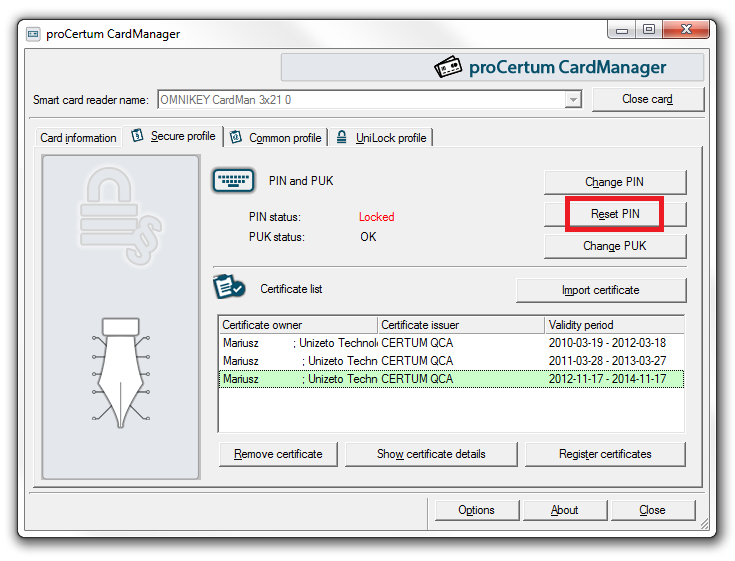 proCertum CardManager application enables managing profiles found on the chip card. All the possible profiles, which can be found on the card, as well as all the possible options connected with the management of these profiles were discussed in the user guide. The availability of the profiles and the options depend on the kind of delivered card and the life cycle of the card. In practice, not all the described options will be available for the appropriate card. To read the content from the card, click Read card. After the card was recognized, the number of the card and all the profiles found on the card are visible as active tabs. The button More info >> additionally displays a table with the list of the profiles and their versions. The service of the appropriate profile is connected with choosing the tab which is corresponding to the profile. During the service, the program is using the file delivered with applications cooperating with this profile. In case of luck of any of the files, the message informing about the name of the file required for correct working of the application will be displayed. Reason: The card was not inserted into the reader. Solution: Insert the chip card into the reader. Reason: The card was not inserted correctly into the reader. PIN/PUK term is being used in this Users guide. The PIN/PUK term means PIN/PUK for the card profile mentioned at that moment. Each profile is separate from others and is protected with individual PIN and PUK code. Blocking of the PIN code or PUK code of one profile does not affect on the status of PIN codes and PUK codes of other profiles. Blocking of the PUK code of one profile is non reversible but it does not affect on other profiles. Three successive incorrect PIN entries will block the profile irreversibly. PIN and PUK codes for the secure profile and Common profile should have between 4 to 8 marks. The exception is the PIN code for secure profile, which has to be composed of only digits. PIN and PUK codes for the UniLock profile should consist of 5 to 12 marks. It is recommended, that PIN and PUK codes should use standard ASCII codes between 32 and 127. The usage of non-standard marks (other than mentioned above, in particular polish diacritical marks) can affect the possibility of not verifying the entered code on the workstation under the control of other operating system or on the workstation with installed other codepage. 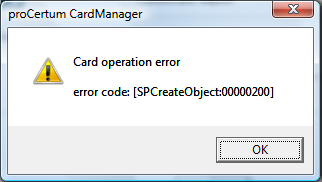 In case of entering non-standard codes, proCertum CardManager displays the message warning against possible consequences of this action. After pressing button Options button it will be displayed Panel which allows to control program options. 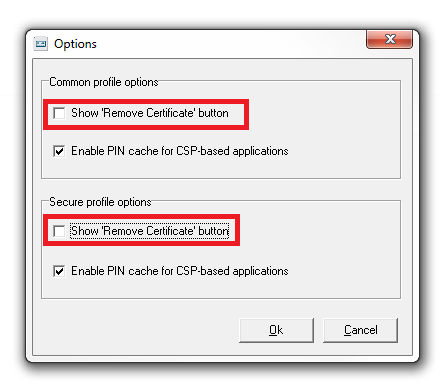 Show ‚Remove Certificate’ button – selecting this options will cause that in the tab common Profile will be visible Remove certificate allowing you to remove the selected certificate. 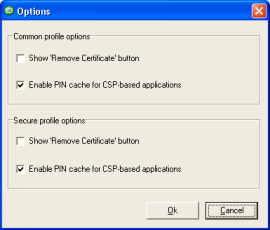 Enable PIN cache for CSP-based applications – selecting this option in CSP- based applications after the first providing of the correct PIN cache it will be automatically stored and used in subsequent attempts to use it without having to re-enter it by user. Options for storing the PIN cache is enabled by default. Whereas the options for deleting certificates are disabled by default. This means that the user who wants to delete the certificate will have firstly to turn on the appropriate option. If you want to manage a profile for qualified certificates select tab Secure Profile. As a result a window informing about the chosen card profile and a certificate list located on this profile will be displayed. For managing Secure Profile, Authentication Module might be required. User usually receives card with already initialized profiles. Therefore the user does not have to initialize the profiles. Chip card can be also delivered with non-initialized profile. 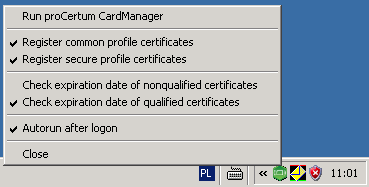 It means that the tab with the name of the profile will appear in the main window of proCertum CardManager application. The profiles can be non-initialized aside from the others. When the profile is not initialized, it means that it is empty and there were no PIN or PUK codes defined for this profile. Non-initialized profile cannot be used (you cannot for example generate a pair of keys or save certificate). During the initialization process the user defines PIN and PUK codes for the profile. Applications supporting operation of cryptographic cards do not detect non-initialized profile. To initialize the profile, click Init profile and then define a new PUK and a new PIN code. You will be asked to confirm the entered code each time. To accept changes click OK. After initialization of the profile it is ready to work. Second initialization of the profile is impossible. It is also not possible to restore the status to the status before the initialization. Defining a new PIN code is certainly required for the correct usage of the card. During the first start of the proCertum CardManager application with a new card, it is required to define a new PIN code. The user will be asked to enter the PUK code and to define a new PIN code. Furthermore the user will be asked to confirm the entered code. To confirm the entered PIN click OK. To quit from generating new PIN code and to save previous settings click Cancel. The proCertum CardManager application will confirm the correctness of entered data. Figure 20: Window informing about the accomplishment of the operation of generating the new PIN code. You will be asked to enter the old PIN code and to enter the new one. You will be also asked to confirm the entered code. To accept entered PIN click OK. If you want to quit and save previous settings, click Cancel. The proCertum CardManager will confirm the correctness of executed changes. You will be asked to enter the old PUK code and to enter the new one. You will be also asked to confirm the entered code. To accept the entered PIN code click OK. If you want to quit and save previous settings, click Cancel. The proCertum CardManager will confirm the correctness of executed changes. If already generated private key is found in the Secure profile, it is possible to save the certificate with the public key fitting to the mentioned private key to this profile. To commit this action click Save certificate. The window enabling saving certificate to Secure profile will appear. After selecting the file (operated formats: .cer, .der), entering correct PIN code and clicking on OK, the certificate will be saved to the secure profile. Enter the PIN code in the PIN field and confirm removing the certificate by clicking OK. To quit from removing the certificate, click on Cancel. The proCertum CardManager application will confirm the correctness of committed changes. Operation of removing certificate is irreversible! The pair of keys corresponding to the certificate will be removed too. Second installation of certificate can be performed by Certification Authority. Certificate registration is possible, when the component and cryptoCertumCSP library component was installed on the workstation. These components are installed automatically during the standard registration. To register certificates, click Register certificates. The proCertum CardManager application confirms completed operation of the registration. Figure 28: Window informing about completed operation of the certificate registration. The above procedure registers all the certificates found on the card in the operating system Windows system. Therefore all the certificates saved on the card can be visible for example in mail programs of the operating system Windows. To become familiar with the individual data, click the proper tab. To manage a profile for non-qualified certificates, select the Common Profile tab. As a result of this action, the window informing about chosen card profile and certificate list available on this profile will be shown. When the profile is non-initialized, it means that it is empty and there were no PIN or PUK codes defined for this profile. To initialize the profile, click Initialize profile and then define a new PUK and a new PIN code. You will be asked each time to confirm the entered code. To accept changes click OK. After initialization of the profile it is ready to work. Second initialization of the profile is impossible. It is not also possible to restore the status to the status before the initialization. You will be asked to enter the old PIN code and to enter the new one. You will be also asked to confirm the entered code. To accept the entered PIN click OK. If you want to quit, click Cancel. The proCertum CardManager will confirm the correctness of executed changes. You will be asked to enter the old PUK code and to enter the new one. You will be also asked to confirm the entered code. To accept the entered PIN code, click OK. If you want to quit and save previous settings, click Cancel. The proCertum CardManager will confirm the correctness of executed changes. Enter the PIN code in the PIN field and confirm removing the certificate by clicking OK. To quit from removing the certificate, click Cancel. The proCertum CardManager application will confirm the correctness of committed changes. Operation of removing the certificate is irreversible! The pair of keys corresponding to the certificate will be removed too. Second installation of certificate can be performed by Certification Authority. The certificate registration is possible, when the library crypto3CSP component was installed on the workstation. Components are installed automatically during the standard installation. Additionally, the installation of Common Electronic Signature might be required (if it was attached to installation CD). The certificate registration can be performed by selecting the function Register certificates. The proCertum CardManager will confirm the registration. The above procedure registers all the certificates located on the card in the operating system Windows. Therefore all the certificates saved on the card can be visible for example in mail programs of the operating system Windows. To become familiar with the individual data, click on the proper tab. 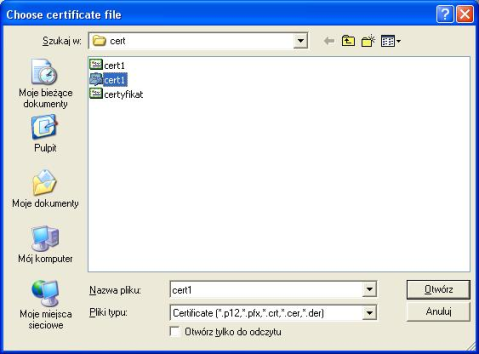 You should enter here the localization of certificate in the file with the extension .pfx or .p12. Furthermore the user should enter password protecting the private key and the PIN code. To accept the operation, click OK. In order to quite from the procedure of import the certificate, click Cancel. The imported certificate will be available at Certificate list. The required length of the key for the imported certificate depends on the kind of the card and can consist of bites between 768 and 1024 or between 768 and 2048. 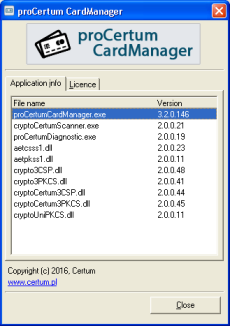 To get the CryptoCertum CardManager applications started please select from the Start menu CryptoCertum Scanner. It will be displayed in tray. Run proCertum CardManager – selecting this option will cause installing of program proCertum CardManager. Register Common profile certificate– selecting this option will cause automatic certificate’s registration from Common profile after inserting a card. Certificate will be installed in the Windows certificate storage. Register Secure profile certificate – selecting this option will cause automatic certificate’s registration from Secure profile after inserting a card. Certificate will be installed in the Windows certificate storage. Check expiration date of nonqualified certificates – selecting this option will cause proof of expiration data of nonqualified certificates. Check expiration date of qualified certificates – selecting this option will cause proof of expiration data of qualified certificates. Autorun after logon – selecting this option will cause application start after second system login or second profile login. Close – this option closes application. After clicking Yes the window with www.page will be opened. The new version of application will be available for downloading from the www.page. To make the mechanism work, the computer must be connected to the Internet. 2. A problem with importing a qualified certificate onto a card using the proCertum CardManager software. There is an error associated with a certificate imported onto a cryptographic card. 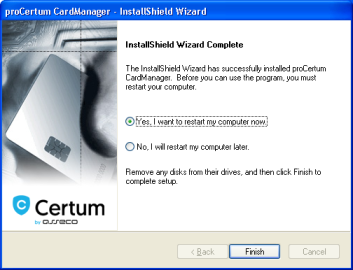 Uninstall the proCertum CardManager software and install its most recent version. The most recent software version can be downloaded here. 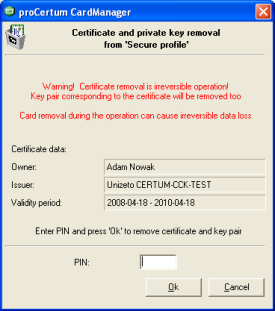 3.	proCertum CardManager informs the user about uncertified keys on the cryptographic card. No certificate on the cryptographic card. 4. 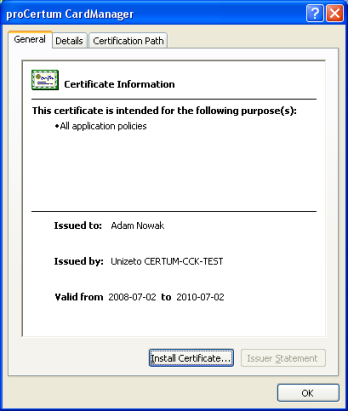 The certificate properties display a message that the certificate has been issued by an untrusted issuer. 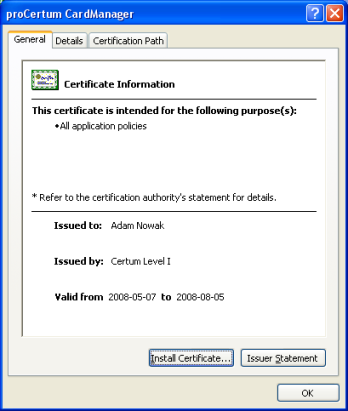 Symptoms appear following the qualified certificate selection from the certificate list and pressing the „Show certificate details” button in the „General” tab – information on certificate. Step 1 – install the Certum PCC qualified certificate. You can download it here. 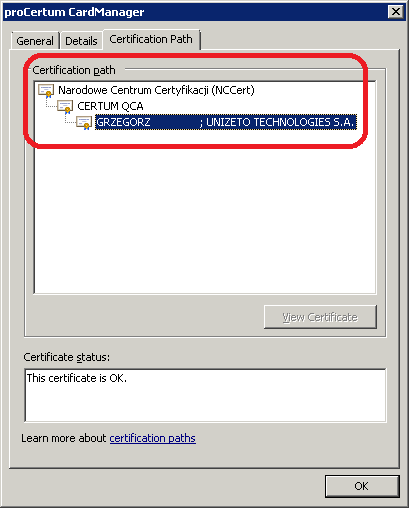 Step 2 – install the CENTRAST National Certification Center qualified certificate. You can download it here. After installing the Certum PCC and CENTRAST National Certification Center certificate attestations, and while displaying the qualified certificate properties, a structure similar to the one presented on the below screen shot should appear in the „Certification path” tab. 5. How can I unlock the PIN code? 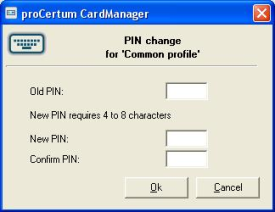 In the proCertum CardManager software the status of the PIN code is identified as blocked. An incorrect PIN code has been entered three times. 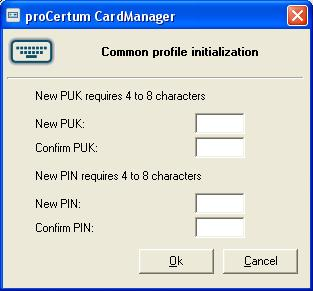 The PIN can be unlocked with the PUK code and the proCertum CardManager software. 6. I have entered an incorrect PIN code three times and it has been blocked. I do not know the PUK code. Can I unlock my card? It is not possible to unlock a card without the PUK code. To replace a cryptographic card please contact our hotline. 7. How can I change my PIN? You can change your PIN code with the proCertum CardManager software. 8. I have entered an incorrect PUK code three times and my cryptographic card has been blocked. In the proCertum CardManager software the status of the PUK code is identified as blocked. While trying to unlock a PIN code the PUK code has been entered incorrectly three times. In the event of blocking a card by entering an incorrect PUK code there is no possibility to unlock it. To replace a cryptographic card please contact our hotline. 9. How can a PUK and PIN code for the card ordinary profile be created for the first time? A user wishes to obtain an unqualified certificate for the card for the first time, but they do not know their PUK and PIN codes. Typically, a processor card is always provided with an „uninitialized” ordinary profile, which means the PUK and PIN codes have not yet been given for them. To activate the profile run the proCertum CardManager application and go to the „Ordinary profile” tab. Then press the „Initiate profile” button and define new PUK and PIN codes. You will be asked to confirm the code entered. To approve the changes press the OK button: Following initialization, the profile is ready to use. 10. Where can I obtain a PUK code for my card Secure profile from? A user wishes to obtain a qualified certificate for the card for the first time, but they do not know their PUK code. Typically, a processor card on delivery does not include a document with the PUK code provided. For security reasons the PUK code is available from the client’s account. Note: After changing the PUK code into your own (different from the one on the account), the code displayed on the client’s account will not correspond any longer to the Secure profile on the card. Note: The PUK code can be obtained only after activating the qualified certificate! Note: Just after the qualified certificate has been given, a tele-code is sent to the client’s e-mail address provided in the activation form. click Obtain PUK code button. After entering the data click the Obtain codes button. The PUK code assigned to your card can be checked from: PUK code. 11. 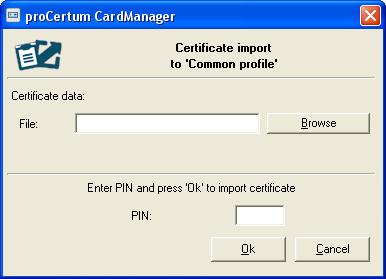 How can I enable in the proCertum CardManager the option to remove a certificate from the card in the secure profile/ordinary profile? There was no „Remove certificate” option in the secure profile or ordinary profile, which made it impossible to remove a certificate from the certificate list. The „Remove certificate” button has been disabled due to accidental removals of certificates by users. Note: The certificate(s) once removed cannot be restored to the profile. The Client has to go through the process of generating a new certificate. 12. Where can I download the proCertum CardManager software from? 13. 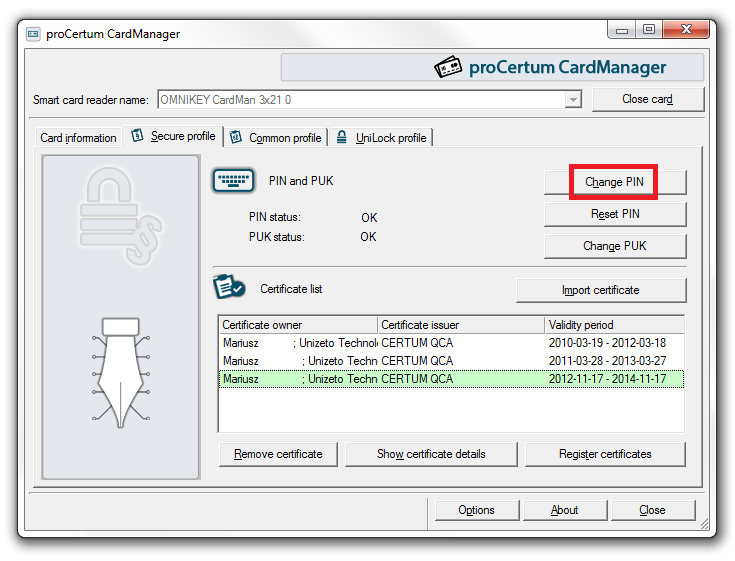 The proCertum CardManager cannot see drivers for the cryptographic card reader although they have been installed. How can I set it up? 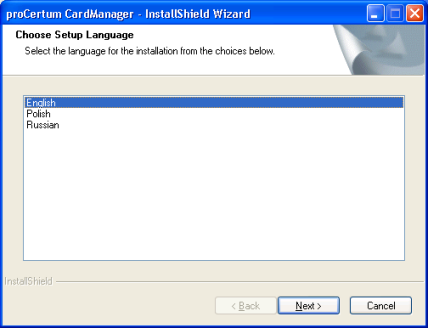 The proCertum CardManager uses the drivers installed in the system. 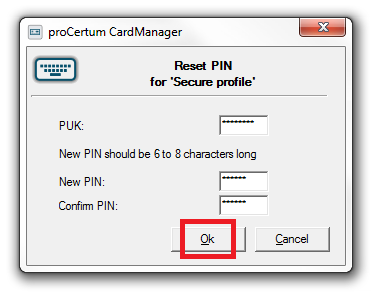 If the card reader is not visible in the proCertum CardManager software, it means that the drivers have not been installed correctly and the process should be repeated, or you should ask for support. 14. The card reader is not recognized by the proCertum CardManager. How can I set it up? You should install the cryptographic card reader drivers correctly. They are provided by the drivers supplier on a software CD. 15. Where can I find a new software version? 16. What are the functions of the profiles: Ordinary and Unilock? This profile enables electronic identification of a cardholder, and is commonly used to secure Internet and e-mail services. It should not be used to append a secure electronic signature. This profile support is performed through software modules provided together with electronic identification cards. The RSA card profile does not provide the possibility to create a secure path or a secure channel. Owing to that fact it is only used in a private environment to append an ordinary (unqualified) electronic signature. 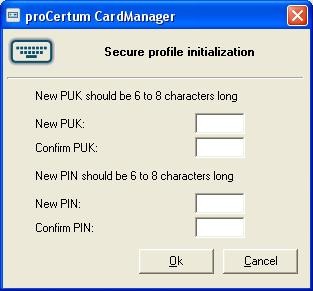 With the use of the cryptoCertum card and the dedicated proCertum Unilock software this profile enables secure computer access management. 17. How can I register a qualified certificate in the Internet Explorer browser store with the proCertum CardManager application? 18. What is the function of the proCertum CardManager? 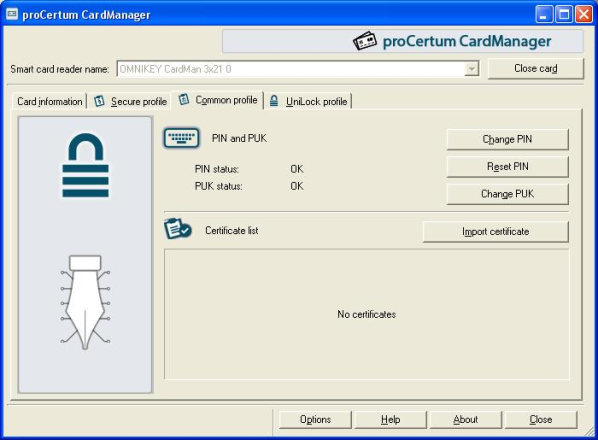 The proCertum CardManager is designed to manage certificate profiles installed on the cryptoCertum card. A user-friendly interface allows even novice users to generate PIN codes for individual certificates, and enables them to remove certificates from the card on their own. 19. Does the application work in MAC and Linus OS? In the case of PKI, this is data for entity authorization and verification of access to a technical component or data warehouse in order to protect data from unauthorized access. A lock of access to a technical component or data warehouse follows several subsequent attempts to provide an incorrect PIN number. Note: Unlocking a blocked technical component requires providing a special PUK number. Unlocking access to a data warehouse requires a warehouse admin operation and changing the PIN number. A technical component may use an additional authentication mechanism with the use of a PUK number in order to enter a new PIN number and a new limit of subsequent incorrect authentication attempts, which is followed by a lock. In the case of PKI technology, this is a code to unlock a technical component (most frequently a cryptographic card) and change the PIN code. A PUK number is given for a particular technical component at its release to the user. 21. Is it possible to load other certificates onto the Unizeto cryptographic card with the proCertum CardManager software? 22. What are the application language versions? 23. 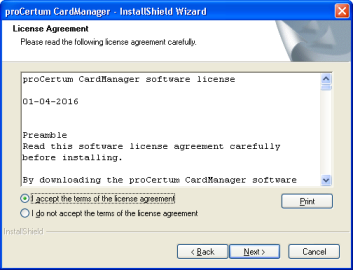 How can I update the proCertum CardManager software to the most recent version? 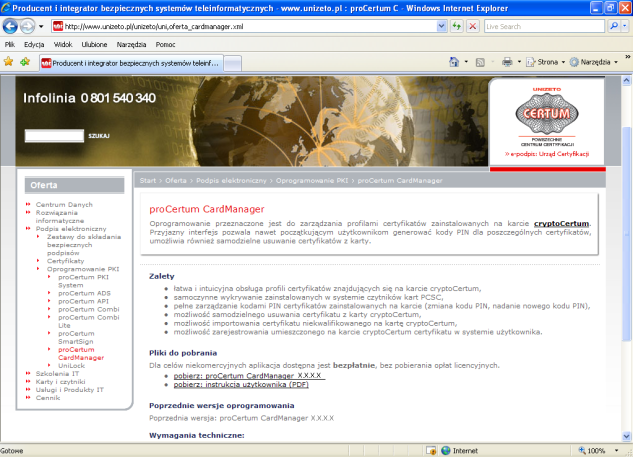 The process description of the proCertum CardManager software installation is included in the user’s documentation. 24. Where can I check the proCertum CardManager software version? 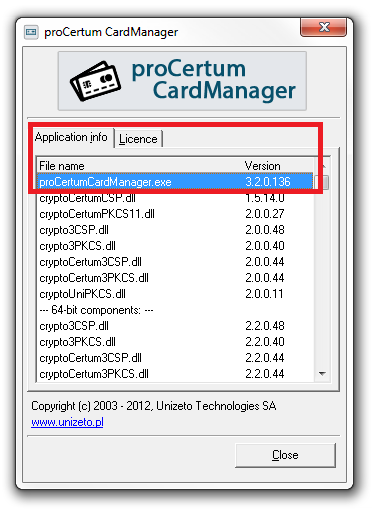 The version number of the currently installed software appears on the right of the proCertum CardManager.exe file name in the „About the software” tab. 25. 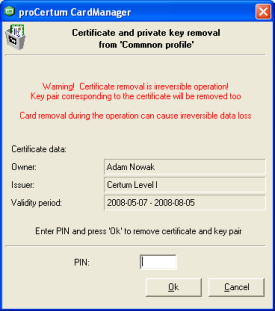 How can I remove a certificate from the card? Note: Removing the certificate is irrevocable! 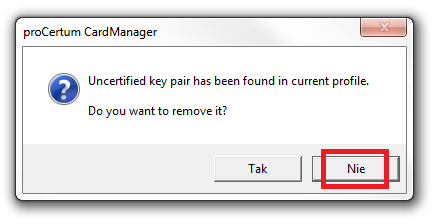 A corresponding pair of keys will be removed together with the certificate. 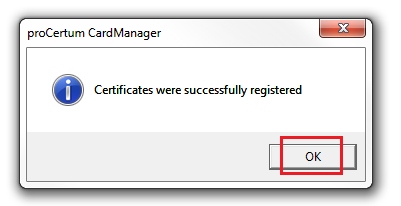 Re-installation of the same certificate on the card will be impossible! 26. How can I install a qualified certificate on a card with no JAVA? 27. 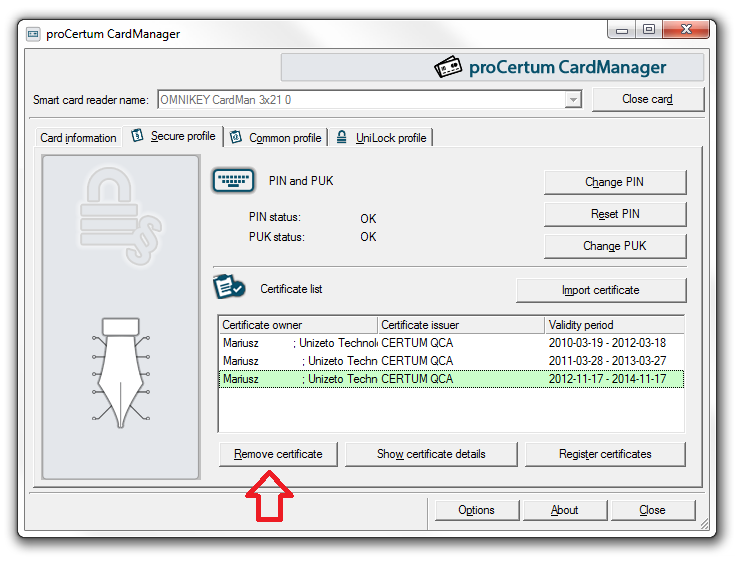 How can I register a certificate in the proCertum CardManager software? 28. How can I remove an old proCertum CardManager version? 29. How many certificates can a cryptographic card accommodate? and up to 10 ordinary certificates. The actual capacity is limited to the size of the card memory and also depends of the certificates’ sizes.